Do you find yourself rushing out the door every morning, short on time no matter how much earlier you wake up? There always seems so much to do in the mornings that preparing a healthy, balanced breakfast is the last thing on your mind! So instead you grab a rusk or a few mouthfuls of sugar-laden cereal or just land up going without. Sound familiar? And it doesn’t end there – by mid-morning your energy levels have crashed, you’re battling to concentrate and you’re on the verge of snapping at the sweet old lady in your local coffee shop! You then reach for the nearest thing resembling food, ignoring your willpower’s futile attempts, which is most likely something sweet and not on your “approved” list! It’s no wonder that breakfast is considered the most important meal of the day. Not only is it important to give you the energy you need to face the day but it also goes hand-in-hand with weight loss. The science is simple – to lose weight we need our metabolism to be working at its most efficient. And to keep our metabolism firing we need to make sure we’re eating a healthy and balanced diet and not skipping meals. 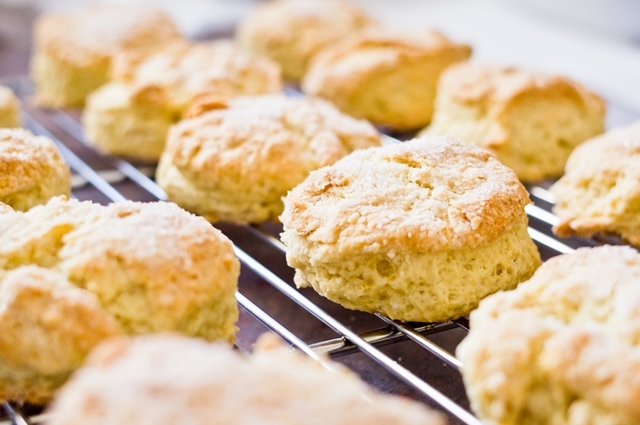 Allow us to take the guess work out of breakfast for you with this simple and healthy recipe for low GI scones. You can have them for an on-the-go breakfast or as a healthy mid-morning snack. Sweetened naturally with apple, even the kids will love these scones as a delicious lunchbox snack. Bake a batch to last you the week! 2. Sift the flour, baking powder, bicarbonate of soda and salt together in a large mixing bowl. 3. Add the oat bran and lift a few times with a tablespoon to incorporate air; add the grated apple and sultanas and mix through. 4. Melt the margarine in the microwave for 20-30 seconds on high. Add the beaten egg and milk and stir. Add the dry ingredients and stir gently with a fork until a dough forms. Do not over-mix. 5. Spoon the dough onto a lightly greased muffin pan. 6. Bake for 15-18 minutes, or until they are golden brown, have risen well and a skewer inserted in the center comes out clean.